Founded in 1986, Quirk’s is the largest media provider in the market research industry. The company produces the Quirk's Marketing Research Review, Quirk’s e-newsletter; Quirk’s Daily News Queue, and various webinars. Combined, these publications have over 60,000 subscribers in 110+ countries! Quirk’s is also the founder of the Quirk’s Event, a leading industry conference (which Op4G attended in January). 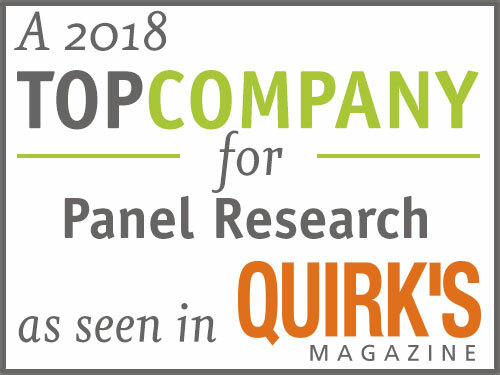 In its press release on the Top Panel Companies, Quirk’s began by highlighting the many benefits of research panels. The company noted that “Research panels give you the convenience of having pre-screened respondents at your fingertips who are ready and willing to participate in surveys, studies or other types of research. [They allow companies to] recruit large groups of participants quickly and easily”, including niche or difficult-to-reach demographics. Quirk’s then proceeded to reveal the Top Panel Companies (in alphabetical order). In the section on Op4G, Quirk’s praised our “unique approach to recruiting” which “yields a highly engaged group of quality people…dedicated to helping market research clients fulfill information needs”. The company also drew attention to Op4G’s impressive donation total and growing number of non-profit partners. In response to this latest recognition, CEO Frank Nappo says “Op4G is honored to be one of Quirk’s Top Panel Companies in 2018. We’ve worked hard to nurture a high quality and engaged panel for our clients and non-profit partners. We’re thrilled that it meets Quirk’s standard for excellence”.